Davon Williams is 19-years-old. The Kansas City native was back in town on spring break from San Diego State. He went there to play football. KANSAS CITY, Mo. — Davon Williams is 19-years-old. The Kansas City native was back in town on spring break from San Diego State. He went there to play football. 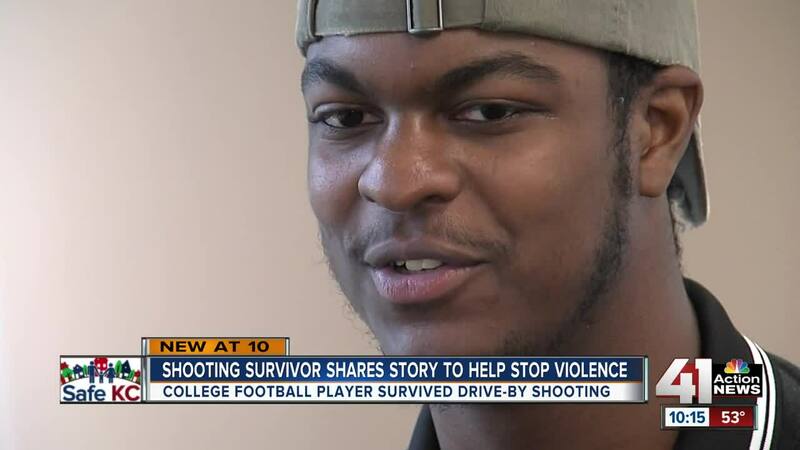 Davon has taken part in a campaign he hopes has an impact on our community. It’s a 30-second video, telling the stories of two crime victims in Kansas City. Both were shot, both survived and both lives are now changed forever. Violence Free KC and Aim 4 Peace are helping roll out this campaign. Rashid Junaid with Aim 4 Peace said it’s one thing to show death, it’s another to show how trauma and violence impacts those who survive. In 2017, Davon was one of 656 aggravated assault victims 18 or younger in Kansas City. That’s more than four times the number of homicides. “Whether you’re hearing gunshots, it happens near your house, it traumatizes you, it traumatizes your kids, it’s happening to all of us,” Junaid said. Junaid and Davon want to show how trauma lives on when the victim survives. They say if you can easily see it and identify it, maybe then you can stop it. Davon Williams sometimes reflects on what could’ve been. Williams is determined to turn this latest setback into a setup. He now wants to be a physical therapist, which is why he’s determined to make the most out of his current physical therapy sessions. The teen wants to be a success story for his patients. Williams started a GoFundMe page to help pay for his medical expenses.